As 2010 came to a conclusion, it was hard to argue with the idea that Cain Velasquez was the top Heavyweight in MMA. He’d destroyed Brock Lesnar to claim the UFC title late that year and as Fedor Emelianenko’s long undefeated run had come to an end at the hands of Fabricio Werdum – who washed out of the UFC in 2008 – nobody really disputed Cain’s spot at the top of the mounted. Nobody that is, except Alistair Overeem. 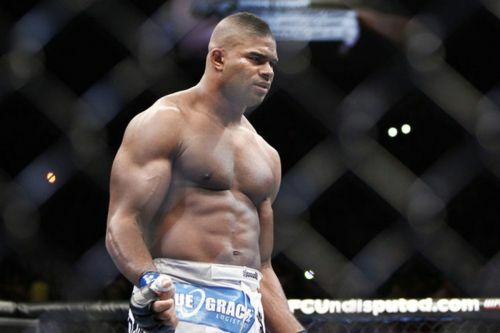 ‘The Reem’ was at his peak in late 2010; the height of the so-called ‘Ubereem’ era. He’d moved up from 205lbs in 2007 and had been consistently packing on muscle since then, and was on a truly destructive run by 2010. He was the reigning StrikeForce Heavyweight champion and he’d also won the K-1 Grand Prix that year, too. And so naturally, everyone dreamed of him coming to the UFC to challenge Velasquez. Of course, Overeem did come to the UFC – but only at the end of 2011, by which point Velasquez had lost his title to Junior Dos Santos. Overeem was set for a fight with JDS, but then failed a drug test and ended up suspended for a year. Velasquez won his title back during the interim, but when Overeem returned, he lost his first fight back, and so any chance of a fight with Cain faded away swiftly. As both men are still competing near the top of the UFC Heavyweight division, there’s a distinct possibility this fight could still happen in the future – perhaps even in 2019 – but realistically both men are past their 2010 primes now and so it wouldn’t be as great as it would’ve been back then.